If you didn't know Turtle Rock Studios was the brains behind 2008's Left 4 Dead, you could probably guess as much after a few hours with its latest game, Evolve. The zombies might be gone in favor of giant monsters and lethal flora, but the basic core of the game's asymmetrical multiplayer experience is instantly familiar. 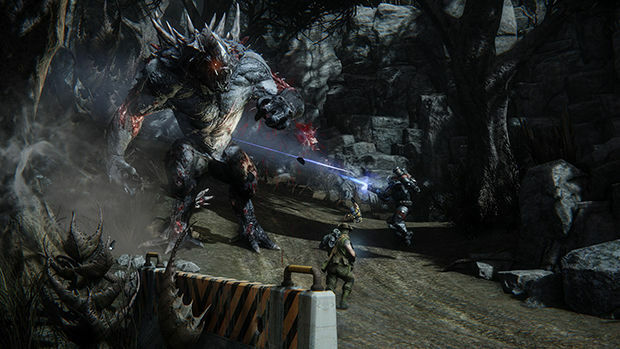 Everything about L4D, both the good and the bad, is concentrated and focused like a laser beam in Evolve. As a huge fan of L4D and rampaging Kaiju-like monsters, the idea of Evolve sounded like a wish come true. But after spending some time with the game, I'm starting to worry the wish was made with a monkey's paw, and I suspect its bony digits are giving me the middle finger behind my back. In the far-flung future, man will have vermin problems. Probably because they insist on trying to colonize planets like Shear, which as far as I can tell is some kind of naturally occurring abattoir specifically designed to end human life. While the inhabitants of Shear are used to the garden-variety land-sharks, lizard-dogs, and carnivorous plants that make up the country side, a new terrifying breed of monster has recently popped up and is seriously imposing on their way of life. That's you. Enter the hunters, an assorted bunch of lovable stock characters and stereotypes contracted to eradicate the beasts and assist in a planet-wide evacuation. That's also you. 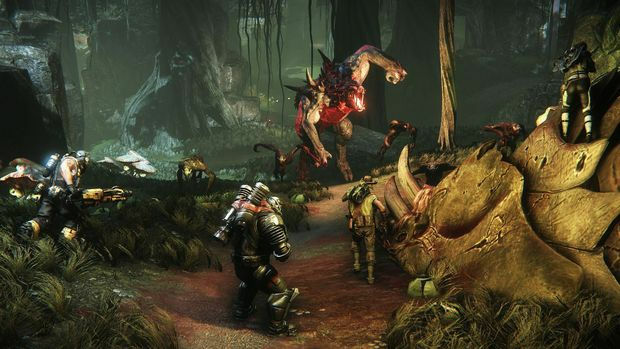 Asymmetry lies at the heart of Evolve's basic premise. Four players control the hunters, each one representing a class that specializes in one particular aspect of monster slaying. Trappers are the most important for the actual hunt, bringing the skills necessary to track and contain the monster. Assault guys, predictably, provide the firepower needed to take the beast down. Medics keep the team going and provide some useful utility like sticking the monster with tranq darts. While support class members fill in the gaps and feature the most diverse range of skills, everything from shields to UAVs. Another player takes control of the monster, a solitary predator who has to not only fend off the hunters, but other hostile life on Shear. The monster isn't a pushover, but it isn't a powerhouse when the match begins either. To become a truly Godzilla-like force of nature, the monster needs to hunt and devour enough prey to evolve through three stages of power, gaining stronger abilities and growing in size at each stage. The main game mode, Hunt, is a straight up fight between the two sides. Attrition is the name of the game as the hunters work to whittle down the monster's health bar and prevent it from evolving, while the monster does its best to covertly feed on wildlife and evade the hunters until it can muscle up to its final stage and overpower them. While the monster has no way of replenishing lost health outside of evolving (and even then it is a limited amount), eating wildlife will let it slather on armor the hunters will have to chew through before doing real damage. Similar to L4D, the human opposition can be incapacitated with enough damage, left to bleed out on the ground and die unless a teammate risks coming over to save them. Each time a hunter is knocked down, he returns with a smaller health bar. Three trips to the dirt and a hunter dies outright. Ideally, this should allow the monster to try to divide and conquer the hunters, isolate them one at a time, and either reduce their overall health for a final inevitable showdown, or stylishly dismantle the team with brutal animal cunning. Sadly, I've yet to see that happen. There is no reason for hunters to split up and the power dynamic between a monster at stage one and a monster at stage three is far too skewed to promote any other play style than rushing to stage three as soon as possible. The vast majority of matches end in one of two ways. In the first scenario, a stage one baby-monster gets caught in the trapper's mobile arena (a force field dome that traps the monster inside) and is unceremoniously slaughtered, or dealt such irrecoverable damage the end of the match is a given. In the second scenario, a monster will successfully string a team along for upwards of ten yawn-inducing minutes until it reaches stage three and utterly steamrolls right through them (unless the monster happens to be a Wraith, then it just does the same at stage two). Neither result is particularly satisfying. It's a shame so much emphasis is placed on the poorly balanced Hunt mode, because the game comes alive in its secondary game modes. Defend, Nest, Rescue, and the most elaborate of them, Evacuation, all provide interesting twists on the formula. Defend has the Hunters struggling to protect generators from a stage three monster and its minions, giving the action a tower-defense feel. Nest flips the relationship, tasking the monster with defending a clutch of eggs scattered over the map. The monster can hatch eggs early to give itself a mini-Goliath ally, but at the cost of doing some of the hunter's work for them. While Rescue litters the map with incapacitated survivors for the hunters and monster to squabble over, allowing both sides the chance to ambush each other. Evacuation is Evolve's campaign substitute, stringing together five random matches as a sort of mini-narrative. Victory in one match will have an effect on the next. 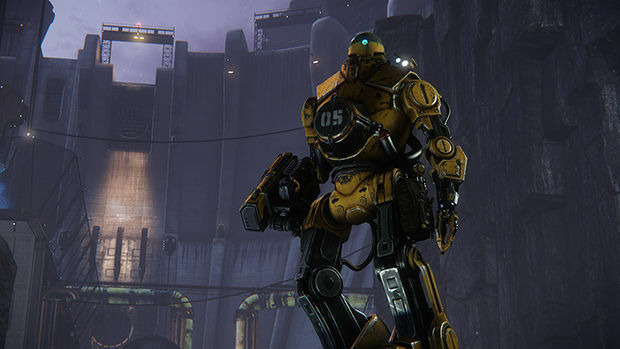 For example, a hunter win might spawn mini-turrets to defend objectives on the next round, while a triumphant monster might cause a troublesome radiation leak at the ol' power plant. There are plenty of variations on the theme, and some of them feel more balanced than others, but they do a good job of establishing real stakes to the struggle. Giving the two sides something to worry about other than each other does wonders for the game. Even basic objectives give both sides the breathing room they need to explore strategies other than “RUN” and “CHASE,” resulting in more interesting matches. So far I've had more fun in any of the extra modes than I have in the premier brand. It's difficult to say how I feel about Evolve at this point. I've had some real fun and I can see the potential for something great. But I've also had many moments of intense frustration. Just like L4D, you are so dependent on other people (both as teammates and as worthy opposition) that getting a good match can be a roll of the dice unless you're playing with friends. Combine that with long wait times between matches (north of three minutes) and you can easily waste an hour or more on fruitless and boring misfires. Another area of annoyance is the character unlocking system. 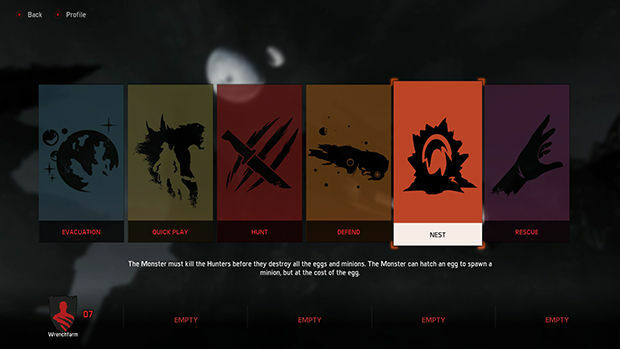 Only four of the twelve hunters and one of the three monsters currently in the game (with more to come through somewhat nefarious DLC) are available from the start, the rest are locked behind challenge goals. Some of these goals can be fulfilled in the course of a couple of regular matches, others are grindy and seem like intentional time-sinks. Crappy progression systems are one thing, but it's another when all the best toys are being kept out of reach. Opinions may differ, but the unlocked characters seem like direct upgrades to the starter roster, and after getting access to a few of them I've never gone back to the defaults. As for the monsters, the flying Leviathan with its powerful ranged attacks certainly is more of a handful to deal with than the ground-bound Goliath, but manageable. The final monster, the Wraith, however, is downright broken. Combining speed, power, and the ability to spawn an AI controlled duplicate to double team the humans, it is leaps and bounds beyond the abilities of an average team of hunters. 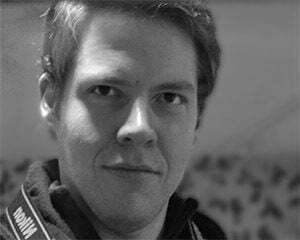 It's hard to say if these are legitimate balance issues that will persist and negatively impact the game in the long term, or just a matter of the community wising up and developing strategies to deal with them. Similarly, while I think the more objective based game modes are definitely more fun than the standard Hunt, I've had a distressingly difficult time finding matches for them. This could be the result of playing in a pre-release environment where there aren't enough players to go around, or it could signal a lack of popular interest in those modes, which would be a tragedy because that's where they hid the good bits. 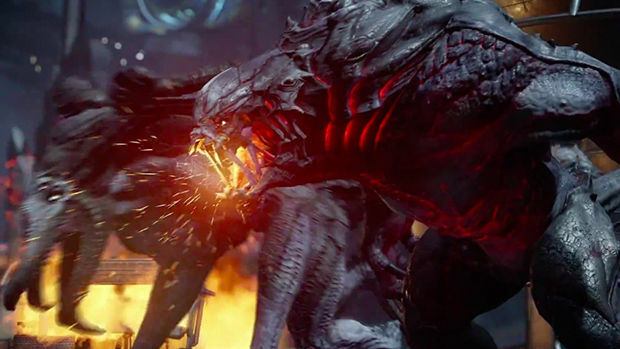 It's too early to render a final verdict on Evolve. I'm going to keep at it now that the game is out for the public, see how some of these issues play out and how the servers do under full retail strain. As of now though, my finely tuned animal instincts are telling me you might want to hold off on that $99 ultra-edition.